Even in the early stages of Operation Barbarossa, the Wehrmacht already felt the need for a more mobile and more powerful anti-tank solution than the existing towed anti-tank guns or tank destroyers like the Panzerjäger I. This need became urgent in late 1941, with the appearance of the new Soviet tanks like the T-34 and Kliment Voroshilov. As an interim solution, it was decided to use both obsolete tanks like the Panzer II and captured vehicles like the Lorraine as the base for makeshift tank destroyers. The result was the Marder series, which were armed with either the 75 mm PaK 40 anti-tank guns or the Russian 76.2mm F-22 Model 1936 divisional field gun, of which large numbers had been captured. To do so, the turret and upper superstructure of the Panzer 38 were removed and a new superstructure was bolted on to the chassis. The upper part, which housed the gun, was open at the top and back and only lightly armoured. Armour protection overall ranged from 10 to 50 mm. A major disadvantage of this variant was its high silhouette, which made it more vulnerable to enemy fire. 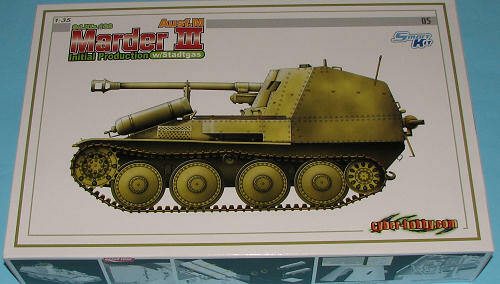 The last Marder III variant was based on the Panzer 38(t) Ausf. M (with Ausf. M standing for Mittelmotor (middle engine)), again armed with the 75 mm PaK 40 anti-tank gun. In this variant, the gun and fighting compartment were located at the rear. Unlike in the previous two Marder IIIs, this compartment was closed at the rear, though still open-topped. It could only carry 27 rounds of ammunition. The Ausf. M did not carry a machinegun in its hull, instead a MG 34 or MG 42 was carried by the crew. The Ausf. M was the variant which was produced in the largest numbers, some 975 vehicles being manufactured in 1943 and early 1944. Its full name was the Panzerjäger 38(t) mit 7.5 cm PaK 40/3 Ausf.M, Sd.Kfz. 138. CyberHobby is one of Dragon's line of specialty kits. They are well known for producing the more interesting and off-beat versions of more common military vehicles. They are also a very limited run and once gone are not reissued. This particular kit is one of those that combines a standard Marder III ausf M with the propane tanks used to fuel those used for training. The kits are quite complete, combining sprues from several other kit types with those specifically designed for this variant. Dragon really knows how to cram a box full of parts and this kit is no different. It touts a number of improvements and upgrades including a slide molded chassis, thinner armor plating, properly designed new gun shield, newly designed engine deck cover, workable breech, new exhaust with p.e. shields, complete engine and a number of other upgrades. The kit includes a fully detailed suspension with optional sprocket and idlers. Dragon's 'Magic Track' individual link track system helps make up a considerable number of the hundreds of parts. Much of the rest is for the full interior and engine detail, for this is no curbside. Like other Dragon kits, the molding is truly superb. A large photo etch sheet is included, meaning that you'll have no real reason to resort to aftermarket. 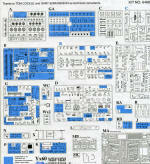 Instructions are up to Dragon's usual standards with 18 superbly drawn construction steps. Color references are with Model Master and Gunze paints. Small detail drawings are included to be sure you get things in the right place. 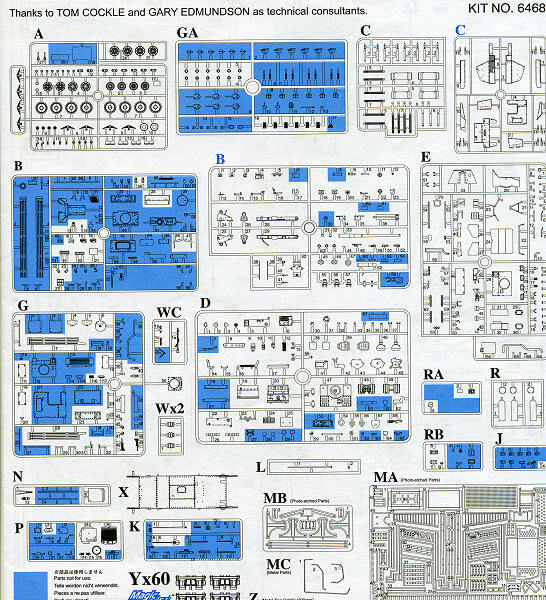 Dragon instruction sheets sometimes have a glitch in terms of part numbers, so it is a good idea to be sure to pay attention during the build. The markings options are quite limited. As not that many were built and most of those used in schools, you won't find much more than insignia on this particular variant. The small sheet is well printed and includes markings for the wooden ammo cases that are included. So there you have it, another unusual limited production vehicle from CyberHobby. 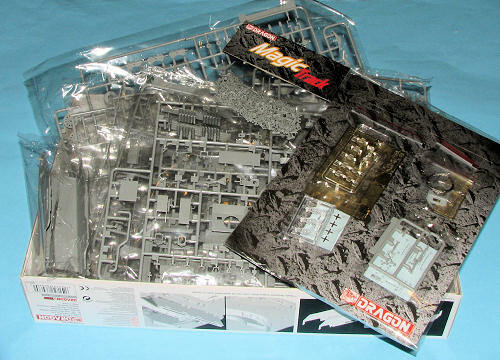 The box states hours of building pleasure and if you have built a modern Dragon or CyberHobby kit, you know that is not just hype. My thanks to www.dragonmodelsusa.com for the preview kit. Get yours today at your local shop or have them order it for you.